Sand Cone Bottle : Plastic, 4 ltr. capacity. approx. Sand Cone Funnel : Seamless metal, turning stopper, 6 1/2″ diameter bottom, 1/2 neck diameter. Base Plate : Cast alumunium, 12″ x 12″. 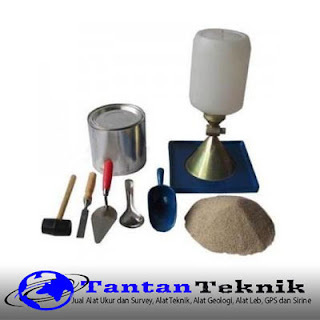 Graduated Sand : Uncemented sand, passing # 10, retained # 60, 25 kg cap. Sample Can : Round can, tinned metal. Scoop : Cast alumunium, large size, round buttom. Spoon :Stainless steel, large size. Trowel : Pointed type, wooden handle. Chisel : Hardened steel, 30 cm length. Rubber Mallet : Rubber head, 0.5 Kg weight, wooden handle.